GamesPlanet has teamed up with noblechairs and Bandai Namco to gift one of their fans with brand new gaming chair! 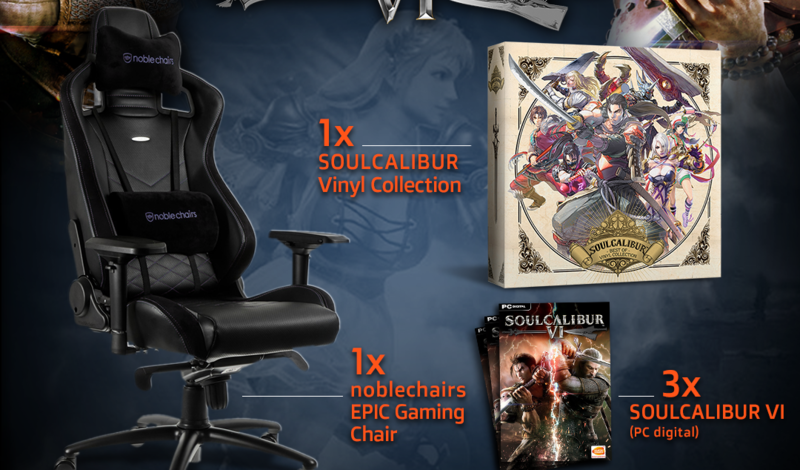 To enter in this noblechairs EPIC Gaming Chair and SOULCALIBUR VI Game Giveaway grab your free entries by following few simple steps listed down below! Poorly built chairs can cause long term damage to the back, eventually resulting in lifelong medical issues. Due to its design, noblechairs will provide the best possible ergonomic support. The EPIC backrest contains characteristic padding which supports the natural curvature of the back in a way that naturally improves posture, alongside the chair possessing a thicker and firmer cold foam core to assist you in keeping a healthy posture. Additionally, complimentary head and lumbar pillows are included to provide additional support, keeping you comfortable through prolonged sessions in front of the computer. The massive aluminum base is very resistant to external influences and can carry a weight of up to 120 kg, which allows you to tilt back up to 135° to get some rest. All of this is supported by a hydraulic piston class 4 and 5 heavy-duty 60 mm nylon roller which slide effortlessly on any surface. Bonus entries: Share your referral link with friends to get an additional 4 entries for each person who enters through the link. 1 x special collectors SOULCALIBUR Vinyl Collection.